It’s Disney World, not land. 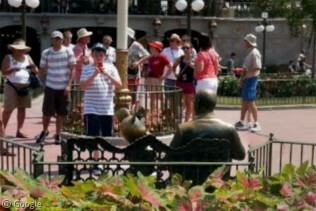 Disneyland is in CA, World in FL. The racetrack that surrounds the pond used to host NASCAR & IRL events; it’s now only used by the Richard Petty Driving Experience, which allows you to drive a stock car yourself… looks like they were on-track that day. Very cool. I live very close to that. We searched for Disneyland and Disney World over and over and it kept putting us in Kansas (the default center of the U.S. I guess)… glad to have found it! I found Epcot first on my own before I new of this site and then used the Monorail to get to the Magic Kingdom. You can do the reverse from the Contemporary Hotel to the South-East of the Magic Kingdom. Anyone found MGM?? MGM is in the low-res section of that map. 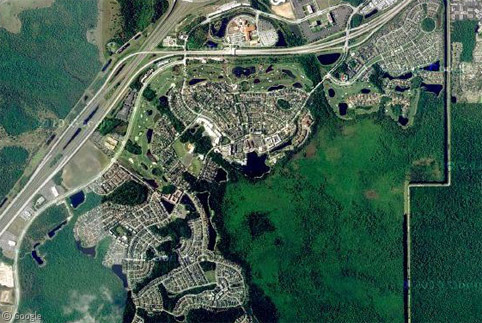 If memory serves, it’s the developed area SW of Epcot, right next to the main road heading north to Magic Kingdom. Same scenario for Animal Kingdom. You can find it due west of MGM. The extreme northern boundary of the park begins to come into the hires view. That’s definitely a pond in the middle of the racetrack, Duane. It’s smack in the middle of the infield. Walt Disney World Resort is definitely a big place! the shape of the lake is actually part of a game really only known to disney world employees called “hidden mickeys” where mickeys are purposly made or involuntarily and in just about every single building you will be able to find one even on major structures wether its the tiles on the floor or an engraving in the cement.